From the Section of Neurology, Department of Clinical Neuroscience, Karolinska Institutet, Stockholm, Sweden. Hyperekplexia (HPX) is a rare familial disorder characterized by an exaggerated startle reflex and stiffness at birth. In 1958, Boris P. Silfverskiöld published a report on a Swedish family affected by “emotionally precipitated drop seizures.”1 This first description of HPX became seminal, but it would take 35 years before mutations in the glycine receptor subunit alpha-1 (GLRA1) gene were discovered as the cause of this disease.2 Subsequently, SLC6A5 and GLRB mutations were discovered as causes of HPX.3 Here, we present a 60-year follow-up of the Silfverskiöld family found to harbor the R271Q mutation in the GLRA1 gene. Some affected patients in this family display unreported features for HPX. This report was made within the frame of a study approved by the local ethics committee (Etikprövningsnämnden 2016/1661-31). The family consisted of 4 affected patients (figure). Phenotype details are provided in the original article and summarized in table e-1 (links.lww.com/NXG/A64). Briefly, 3 patients had early-onset violent and injurious falls triggered by unexpected stimuli (II-1, II-2, and III-1) causing a skull fracture in 2 (II-1 and II-2). Three patients had hypnagogic myoclonus and a good response to phenobarbital. At times, symptoms receded spontaneously in patient II-1. Reported onset in I-1 (J.E.) was at age 40 years; he had startle with falls once or twice per year. Siblings II-1 (A.W.) and II-2 (B.E.) lost consciousness sometimes after startle-related falls.1 Patient II-1 was diagnosed with late-onset dementia and died at age 87 years; patient II-2 was found drowned in a bathtub at age 76 years. Patient III-1 was aged 10 years at the time of the publication; at present, she is a 66-year-old retired school teacher. She was diagnosed with stiff baby syndrome. Patient III-1 had symptoms until age 13 years. At that point, symptoms receded spontaneously until age 27 years. When her symptoms reappeared, beneficial treatment with clonazepam was started and continued since then. Patient IV-1, born in 1976, presented with insidious clumsiness starting in childhood and later startle reactions. She underwent surgery for umbilical hernia at age 1 year. Stiffness became gradually persistent between startle reactions during adolescence; treatment with clonazepam was started at age 22 years. She has also been on continuous antidepressant treatment; Gabapentin was added later because of diffuse pain. She works part time as a preschool teacher. At age 32 years, she developed anxiety, weight loss, and gait difficulties. On examination, an exaggerated head-retraction reflex, hesitant gait, tremulous jerks in all extremities, and tremor of variable frequency were evident; the latter indicates a functional overlay. EMG displayed 80 ms polymorph bursts with a constant frequency of 7 Hz; there was no evidence of neuropathy; MRI of her brain was normal. 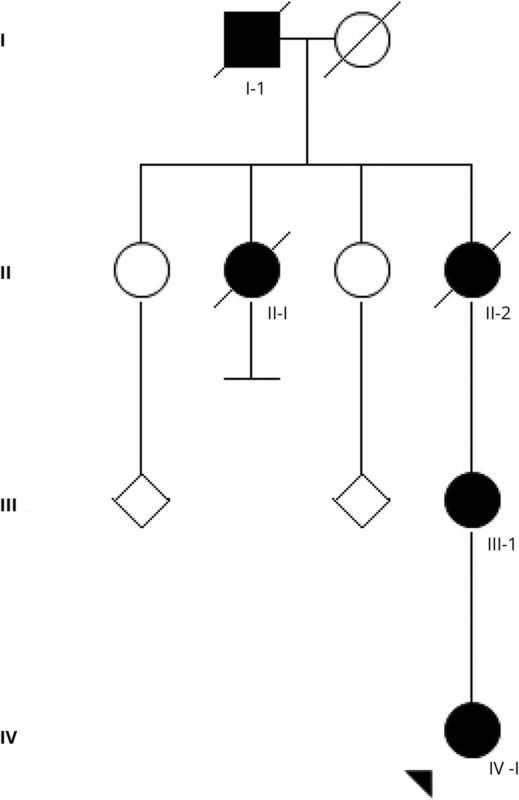 The heterozygous mutation c.896G>A (R271Q) in GLRA1 was found in patients III-1 and IV-1. Phenotype details on patients III-1 and IV-1 are provided in the text, both patients harbor the recurrent R271Q mutation in GLRA1. HPX occurs also as part of severe neurodevelopmental syndromes associated with mutations in ARHGEF9 and GPHN, the latter is a lethal condition, which illustrates the importance of etiologic diagnosis. A variety of animal models and in vitro studies have provided valuable knowledge on HPX associated with GLRA1 mutations,3,6,7 but questions about pathophysiology and variable expressivity still await answers. M. Paucar, J. Waldthaler, and P. Svenningsson: study concept, data collection, and writing of the manuscript. P. Svenningsson: editing of the manuscript. This study was supported by the Stockholm County Council. M. Paucar and J. Waldthaler have received research support from the Stockholm County Council. P. Svenningsson serves or has served on the scientific advisory board of CBD solutions AB; serves or has served on the editorial boards of PLoS One and Neuropharmacology; and has received research support from the Swedish Research Council, ALF Stockholm, and Wallenberg. Full disclosure form information provided by the authors is available with the full text of this article at Neurology.org/NG. The authors are grateful to the patients for consenting to this report and to Dr. Ruth H. Walker for review of the draft. Accepted in final form June 6, 2018.
. A family with emotionally precipitated drop seizures. Acta Psychiatr Neurol Scand 1958;33:471–476.
. Mutations in the alpha 1 subunit of the inhibitory glycine receptor cause the dominant neurologic disorder, hyperekplexia. Nat Genet 1993;5:351–358.
. Genotype-phenotype correlations in hyperekplexia: apnoeas, learning difficulties and speech delay. Brain 2013;136:3085–3095.
. Phenotypic variability of DYT1-PTD: does the clinical spectrum include psychogenic dystonia? Mov Disord 2002;17:1058–1063.
. Ethnicity can predict GLRA1 genotypes in hyperekplexia. J Neurol Neurosurg Psychiatry 2015;86:341–343.
. Pathophysiological mechanisms of dominant and recessive GLRA1 mutations in hyperekplexia. J Neurosci 2010;30:9612–9620.
. The genetics of hyperekplexia: more than startle! Trends Genet 2008;24:439–447.